Prithvirajan is a college student. Being from a poor family, he works as a newspaper delivering boy. One day during work he sees Veena and falls in love with her. She is also from the same college and after understanding the hero’s love she too falls for him. Veena’s father Gajaraj and brother M S Kumar hold key positions in a caste based party which opposes intercaste marriages. They come to know about Veena’s love and arrange her marriage with someone else. Veena elopes with Prithvirajan, and Gajaraj dies not able to bear the insult. Following this, Kumar separates his sister from Prithviraj and brings her back home. What happens after this, did the couple come together again forms the rest. Director Madhu Raj has taken up a bold script for his debut movie and has portrayed the various problems faced in the society due to caste discrimination. The movie revolves around the love story of the lead pairs and also tries to create an awareness about the ill effects of caste. 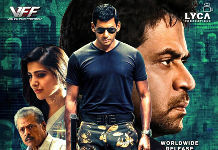 Prithviraj who has tried his best to suit the character could have done better. Veena looks beautiful and has suited her role well. M S Kumar has a strong character and has done extremely well in his role. Music by R N Uthamarajan are okay and cinematography by Senthil Kumar has captured village life beautifully. Thodra is a film which emphasises that getting attached to caste will do no good.